UkraineHeading home from Odessa, we stayed a few days to enjoy Kiev. Kiev has a chain of self-service resturants that became my lifeline to lunch - good, filling peasant food for about a buck a plate. Below, in the Podil district. 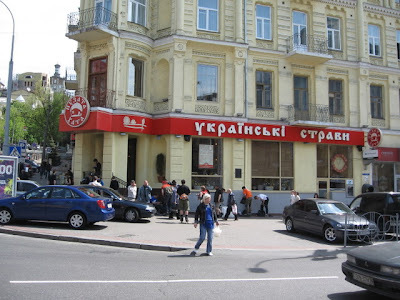 We found these all over town - always packed, always serving fresh dishes, 100% Ukrainian... 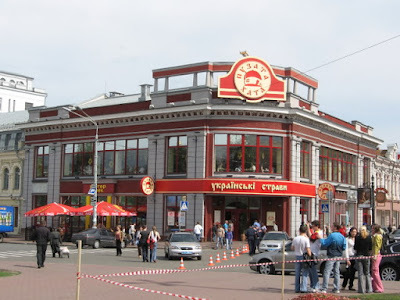 This next one is directly behind the Bessarabian Market. 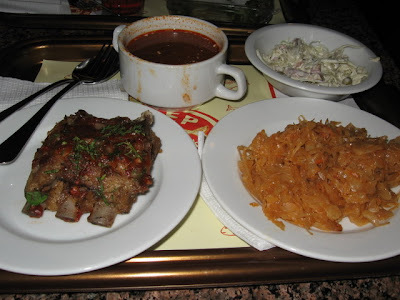 Here is a $5 dinner: borscht, baked ribs, stewed cabbage, cabbage salad. I was worried about eating low carb meals in the Ukraine. Silly me. 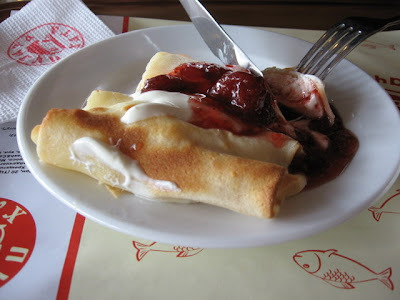 Blintzes, which Fumie eats as an afternoon snack. Cheese filled with sour cream and berry preserves. These were called "blintzy" which will forever cause my appreciation of blintzes as a Jewish heritage food to be filled with mirth and frivololity. Blintzy! Blintzy! Blintzy! Fruit filled vareniky dumplings. No, I didn't try these, Fumie did, several time a day. She is much smaller than me. I am much bigger than her. Salo is salt cured bacon fat. Often consumed raw with onions, salo is the stereotypical Ukrainian snack, and the point of many Ukrainian jokes (i.e. : A customs official asks a Ukrainian traveller "Do you have any Drugs?" The Ukrainian answers "Yes. I am carrying salo." "But salo is not a drug!" "Yes it is. When I eat salo I get high..." There is even the phenomenon of chocolate covered salo served in fancy resturants. 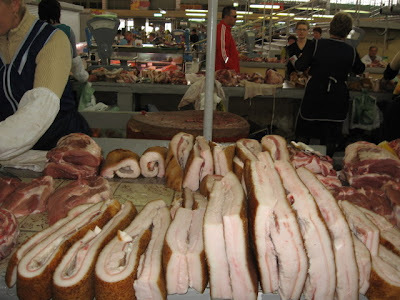 Even Hungarians, who really love raw bacon and consume it daily, haven't quite made a national cult of pig fat. Bacon. We all love bacon, don't we? I am taking it that not too many frum Jews read Dumneazu, so I'll just say what we all think: bacon is treyf, forbidden, unkosher. And so good. 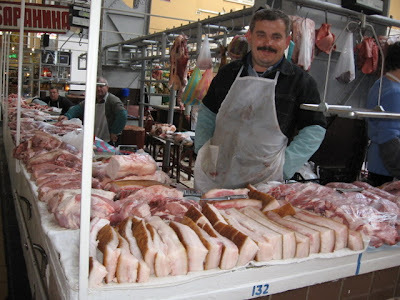 Ukrainians agree, and eat their local version, known as salo, raw. That's right. Pig fat sashimi. Yes they have cured and smoked bacon as well, but there is nothing they love more than some raw pig fat. 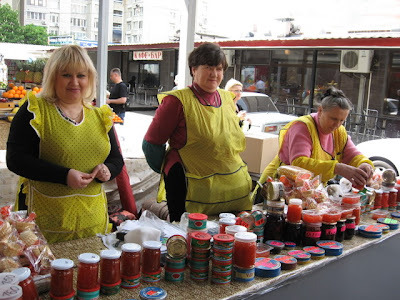 Given that Ukrainians make about EU 130 a month on average, I can only wonder who it is that chows dowm on all the caviar sold in the market. Most of the jars contain salmon caviar from farm raised fish, but for $10 you can chow down on fish eggs for breakfast in an amount that would set you back about $200 in a japanese restaurant. Kvas trucks began appearing toward the end of the trip. 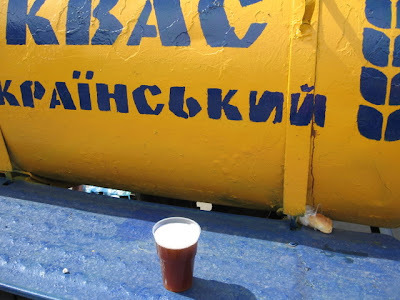 Kvas is considered a summer drink, and tank trucks appear at city squares offering plastic cups of this fizzy fermented bread drink. It's fantastic on a hot day. I am definately going to try brewing kvas this summer. Although fermented, it is so low in alcohol that is considered acceptable for consumption by children in Russia and the Ukraine. Horilka is the Ukrainian for vodka. 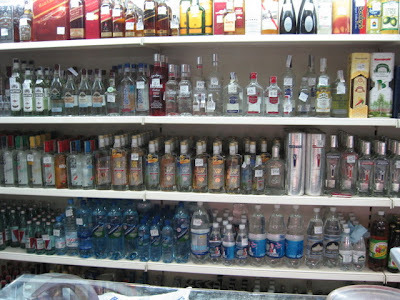 And my, how people love their vodka. A bottle of pure grain based spirit was about $3, and as long as you didn't mix it with anything like beer or wine, one could wake up in the morning with virtually no hangover at all. 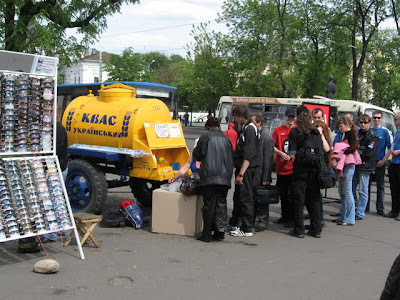 We used to have those yellow tanks selling kvas ('kali' in Estonian) on the streets during the soviet time. I loved it, and remember queuing for a glass with my parents. Nowadays you can buy kvas bottled in every supermarket, and it's giving Coca Cola a pretty hard time during summer! !